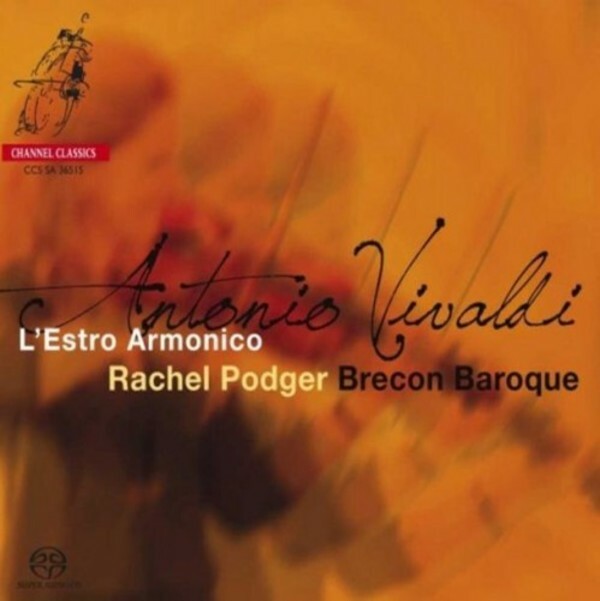 Vivaldi augmented his reputation as ‘The Red Priest’ with ‘L'Estro Armonico’ Op.3, a collection of twelve concertos for one, two and four violins. The title of the collection encapsulates the qualities that so entranced Vivaldi’s contemporaries. ‘L’Estro Armonico’, which might be translated as ‘musical rapture’, reflects the vitality and freshness of Vivaldi’s invention: its rhythmic energy, melodic and harmonic intensity, textural sensuousness, performative brilliance and dramatic flair. The dynamic ensemble Brecon Baroque was founded in 2007 by violinist and director Rachel Podger as resident ensemble at her annual Brecon Baroque Festival. The international line-up consists of some of some of the leading lights in the period instrument world. Brecon Baroque specialises in the music of J S Bach and his contemporaries, mostly as a one-to-a-part ensemble based on the Cafe Zimmerman ensemble which Bach himself directed. They also appear as a small baroque orchestra for Vivaldi, Telemann, Purcell and Handel. From the very outset, Rachel Podger and her colleagues in Brecon Baroque set their stamp on these performances: buoyant, lively, and above all joyous. Vivaldi’s Opus 3 – a set of twelve concertos entitled L’Estro Armonico – was his breakthrough collection, reaching audiences across Europe and making a particular impression on J.S. Bach, who arranged no fewer than of six of them. The concertos were published in Amsterdam as a set of eight part-books – four violins, two violas, cello and continuo – suitable for performance either by a large string group with solo and tutti interaction, or by a solo ensemble of just one instrument per part. With the exception of some nicely-judged additional continuo instruments, it is the latter one-per-part approach that is taken on this new disc from Channel Classics, and it works stunningly well. As a result, we get the sense that Vivaldi is not just setting out his own compositional stall here, but is also showcasing the musical possibilities of the entire violin family, which reached true ascendancy in the Baroque period. And it helps that Brecon Baroque boasts some of the finest players in the business, wearing their virtuosity lightly in performances that positively bubble with energy. Unlike some ensembles who over-egg the pudding with excessive ornamentation and rubato, Brecon Baroque exercise unerring good taste, enhancing rather than distracting from Vivaldi’s seemingly limitless invention. The continuo instruments – two theorbos, a guitar, harpsichord and organ – are likewise thoughtfully deployed. Fast movements have a sparkle and rhythmic resilience that match the best from any quarter, while the slow movements combine poise with a rapt intensity that holds the listener spellbound. At every turn it’s evident that these performances have benefitted enormously from being recorded only after a series of concert performances, retaining a spontaneous flair while leaving no detail to chance. Try the opening movement of the Concerto No.8 in A minor, complete with deliciously thrumming guitar continuo, and the exquisitely balanced Larghetto which follows, to hear how this combination of spontaneity and reflection makes itself felt in practice. The sense of enjoyment is tangible throughout. The recording, produced by Jonathan Freeman-Attwood at St John’s, Upper Norwood, is well up to Channel Classics’ usual high standards, and these discs – which join Rachel Podger’s earlier recordings of Vivaldi’s La Stravaganza and La Cetra concertos – can comfortably take their place at the head of an extremely competitive field.